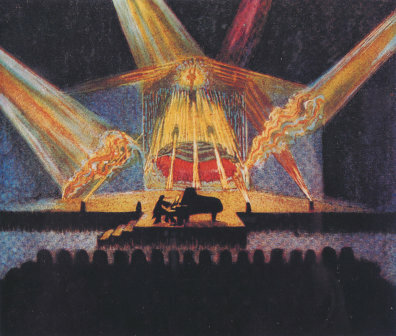 A Color-Light Concert by Alexander László painted by Matthias Holl, published in Alexander László's book Die Farblichtmusik (1925). The Hungarian pianist and composer Alexander László (1895–1970) created his color-light music to enable the audience to participate in the color associations he perceived while playing the piano with a richly timbral touch. He therefore constructed a device that by means of multiple slide projections made shifting colors and forms appear on a screen while he sat at the piano and his staff operated the technology behind the audience. László’s color organ should thus be viewed as the combination of a mixing console, the technically altered slide projectors it controls, and small spotlights. 1. Light ornamentation: Music and colored light communicated the same mood. A colored ornament, similar to the images produced by a kaleidoscope, was projected onto a screen or the ceiling of the auditorium, remained constant, and accompanied music from the early romantic period, such as, for example, Frédéric Chopin or Robert Schumann. 2. Russian color music: In order to increase the intensity of the music, the entire room was immersed in colored light that emulated the music’s changing emotions. László played music from the late romantic period, primarily by Alexander Scriabin and Sergei Rachmaninoff. 3. Color-light music proper: As art forms of equal value, music and painting were combined to create a new form of art László referred to as color-light music. Unlike Alexander Wallace Rimington or Mary Hallock-Greenewalt, László did not visualize well-known compositions, but in collaboration with the painter Matthias Holl created both music and light painting in an interdependent creative process. Like in cinema, a screen was used for the projection. László played only his own compositions, above all op. 9–11, with slides produced specifically for the occasion (ill. 2). Exactly 200 years after Castel’s concepts, the picture painted by Holl represents the first historical snapshot in time of a performance with a color organ and visible projection. The first public presentation of László’s color organ took place in Kiel in 1925. He subsequently spent two years traveling throughout Germany with his color-light music. Beginning in 1928, László turned to film music. In 1935 he briefly considered continuing his art using color film, something documented in a letter to Oskar Fischinger. After immigrating to the United States in 1938, he began refining his color-light- music, yet there is no proof it was ever performed. In 1943 he went to Hollywood, where he wrote scores for about sixty feature films.